We won't cover old ground here, we know the benchmarks are exemplary. They only keep getting better, and with good reason. Designing and building an increasing number of its own class-leading components enables Apple to optimize the interplay between software and hardware to control its own destiny. Steve Jobs often quoted Alan Kay as saying "People who are really serious about software should make their own hardware". It's no coincidence that just as Apple starts to take Augmented Reality seriously, they develop their own GPU. The result is that iOS quirks withstanding, in day to day use the iPhone 8 Plus does everything you ask of it and you're not left wanting. Earlier we briefly covered Augmented Reality (AR), and it's a great test of the capabilities of the iPhone 8 Plus. One app in particular that we keep returning to because of it's real-world value is IKEA place. More than just a great technology demo, IKEA place provides real value in allowing you to view furniture in your own home or office accurately. 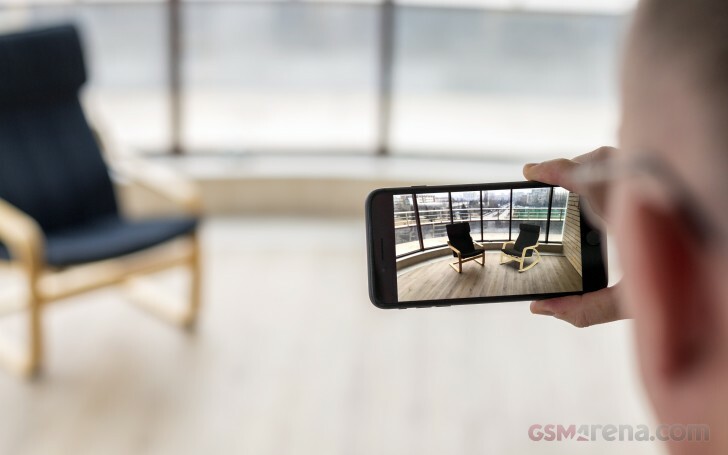 It's the power of the CPU, GPU and ArKit software framework that ensures the technology doesn't get in the way and you can get on with the task in hand of choosing furniture. We've been genuinely impressed with how it copes in all lighting and room scenarios so far (before you ask - 'no' we're not sponsored by Ikea). One departing observation though. We love the fact that Apple now provides base storage starting at 64GB. We still can't say the same for RAM though. We know iOS, and the hardware together makes efficient use of all available memory, and in single application use, it's not an issue. Switching between tasks, however, highlights the lack of memory. Your workflow is 'paused' as data has to be reloaded. For example, web-pages having to be refreshed, e-books having to be reloaded. This is more pronounced as the rest of the system is lightning fast. While we don't need to go to the heady heights of its rivals - we'd like to see 4GB as standard in the next generation. Straight out the gate, it's very ungenerous of Apple not to include a fast charger. Charging the iPhone 8 Plus either wired or wirelessly, via the included 5W charger is excruciating slow. If money is no object and then invest in a USB-C charger and USB-C to Lightning cable. This combination will top your tank up to 79% in an hour. We use our iPad's 12W charger which gives us 72% charge within the same hour. We still don't find it to be as quick as some of the quick charge solutions from companies such as Oppo/OnePlus or Huawei. When it comes to battery life though we're more than happy. Packing a slightly smaller 2691 mAh battery than an iPhone 7 Plus we can comfortably get two days of usage on a single charge, and we still haven't found a high-end Android phone which gives us that long battery life. The best we've tried get us a day and a half - the Galaxy Note 8, Pixel 2 XL and the Mate 9. We'll try not to cover old ground as we reported on wireless charging in our iPhone X Long-term review. Suffice to say that wireless charging is a welcome and long overdue addition to the iPhone family. 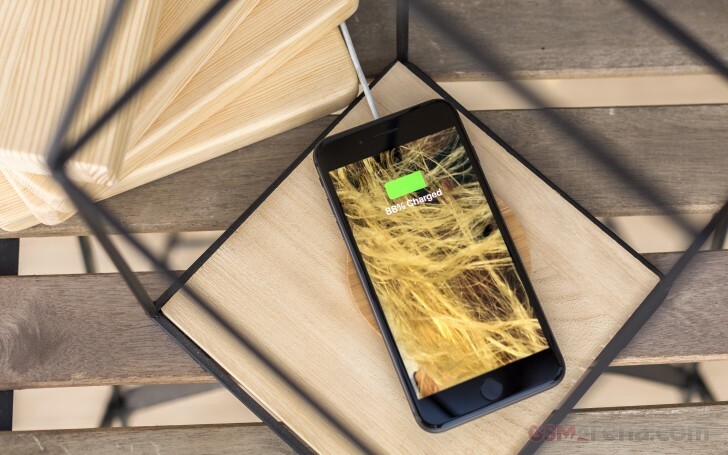 In our continued investigations, we discovered that Apple adopted version 1.1 of the Qi wireless charging standard from the Wireless Power Consortium (WPC) to implement in the latest iPhones. This standard tops out at 7.5W of charge. We previously suggested that Apple would enable 15W charging when the AirPower Mat is launched later this year to differentiate its own product and potentially justify its price - our bad. As it turns out, that will not be the case. So buying a 15W wireless charger, while future proofing your set-up, won't result in being able to charge your iPhone 8 Plus any faster now or in the future. We'll wait and see if Apple adopts version 1.2 of the Qi wireless charging standard that enables wireless fast charging topping out at 15W. As we observed in our iPhone X long-term review, while charging still works through thin iPhone silicon cases, it still requires the phone to be placed accurately in the center of the charger. If the phone is misaligned by more than a few centimeters, the charging stops. On more than one occasion this has resulted in a partially charged phone as we've either not placed it correctly or it's got knocked. Which brings us to the next page, where we discuss all the little annoyances we've stumbled into while using the smartphone.